This has made it to one of my favourite slot games. Despite the scary masks, there are some really generous prizes available here, plus a seriously fun bonus game with free spin rewards. Plus, the frog symbol is really cute and the hero of the slot. What is the Zuma Slots review about, if not a Zuma, you may ask? And you would be right to as this review is actually about one of 888's most mysterious and spooky slot games. As the Zuma Slots reels spin, there are flashing colous, bright and dazzling. As they roll to a atop, we see the masks staring back at us, unabashed in all their shocking glory. 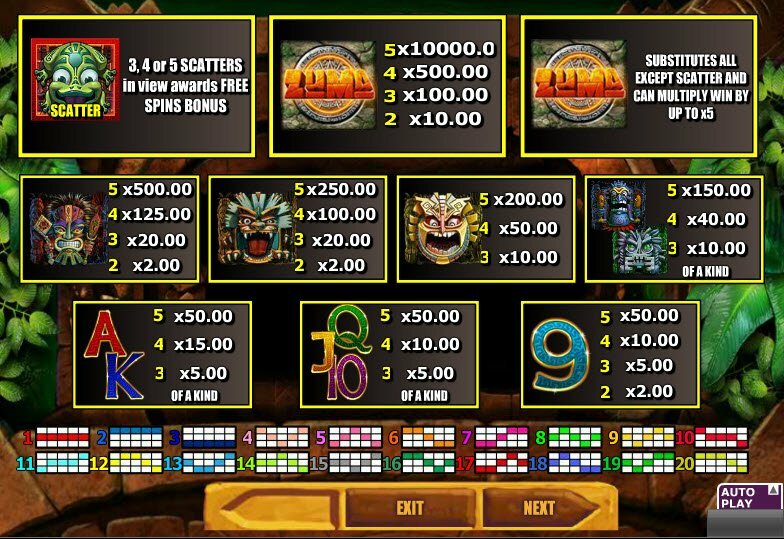 These Aztec jungalistic Tiki masks give Zuma Slots game 5-Reel, 20 payline slot game a depth and darkness, as the grotesque masks look back out on you, while also helping you spin winning lines. As you reel in the special feature symbols, you will be met with crashing sounds, blasting their way into your inner depths, frightening you to your very depths, like the masks themselves. Even the high card number symbols have an air of doom and gloom about them, with muted deep colours, and jagged golden edges. The frog mask, in heavy contrast, is very cute indeed. It could even be considered our saving grace, as I explain more about its powers in the next paragraph. The frog mask, in heavy contrast, is very cute indeed. 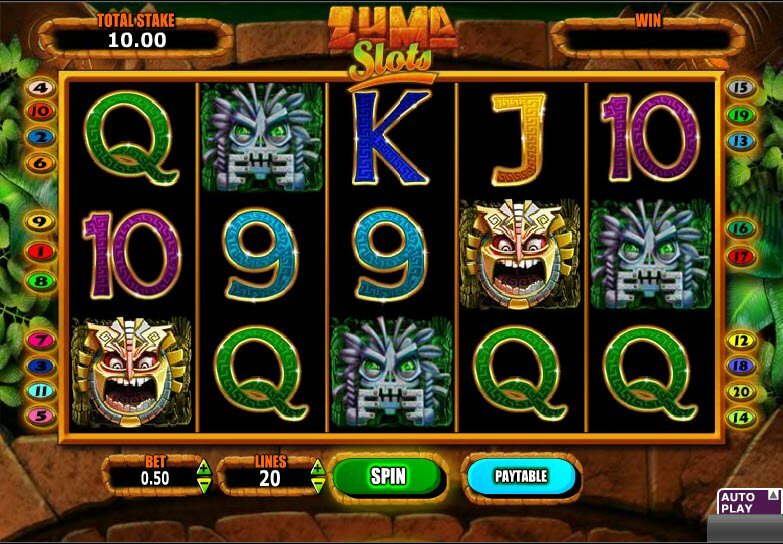 The Zuma Slots slot machine bonus feature of free spins is innovative and extremely enjoyable, our cute frog mask will shoot one of the scary, unfriendly symbol masks and you will be awarded accordingly with a number of free spins. The ugliest mask may just be the key to the most amount of free spins on offer. If you're lucky like me, you may even manage to get yourself another bonus round from the free spins lining up the required Zuma Slots bonus symbols and get your winnings multiplied. 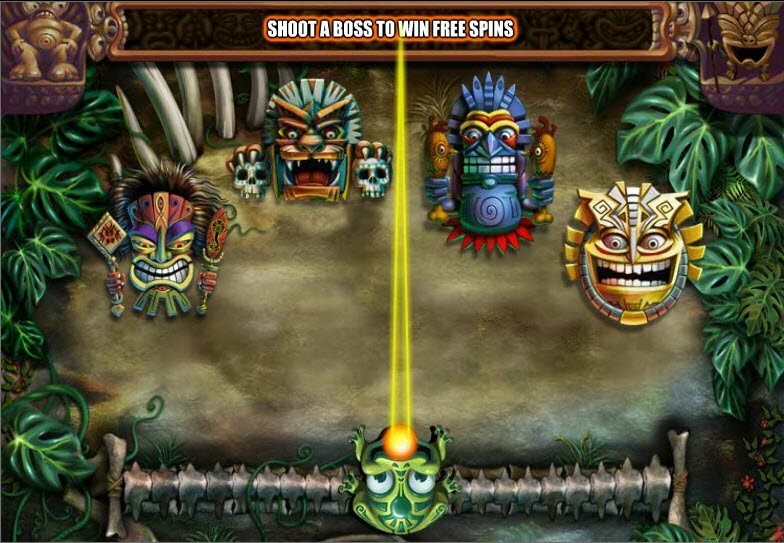 The Zuma Slots jackpot is simply huge, and combined with the fun way to win free spins, makes this game worth playing, despite the frights of the masks themselves.